How good (could we make it) ? – Dirty wet dog , boats and sailing. How good (could we make it) ? This is of course part 2 of the previous post “how bad could it be” and is a post that i have been tinkering with for a while but that i needed to set out a worst case picture first. In the previous post i took an actual experience , teaching aboard a very workaday boat, and began an explanation of what had and hadn’t been done to that boat which made it into perhaps the worst boat i have ever sailed. That boat, one of the Macwesters, started out as a capable ‘steady’ cruising boat, certainly nothing sparkling but was made almost non sail-able by way of a filthy bottom, a slack rig, old and baggy sails, soft halyards and so on. I honestly couldn’t get that boat upwind over a foul tide in Portsmouth harbour. In this post then i take the strange idea of how to really spoil a basically capable boat and it’s polar opposite which is to take a steady unexciting boat and make it as ‘un-bad’ as possible, to do that i will have to set out a fundamental concept of my own. As is my way though i will start with a story from my own recent sailing experiences. Towards the end of my voyage from Ipswich around to Plymouth with the gaff rigged Inanda we came out of Dartmouth one morning and picked up the first wind that wasn’t directly on the nose. In fact we had almost a run down to start point which i turned into a series of downwind tacks to get the best angles. Two other gaffers came out behind us and the one in the lead photograph gradually overtook us using the same approach. I didn’t mind too much as the other boat had at least 3 feet more waterline and was carrying a lot more sail. 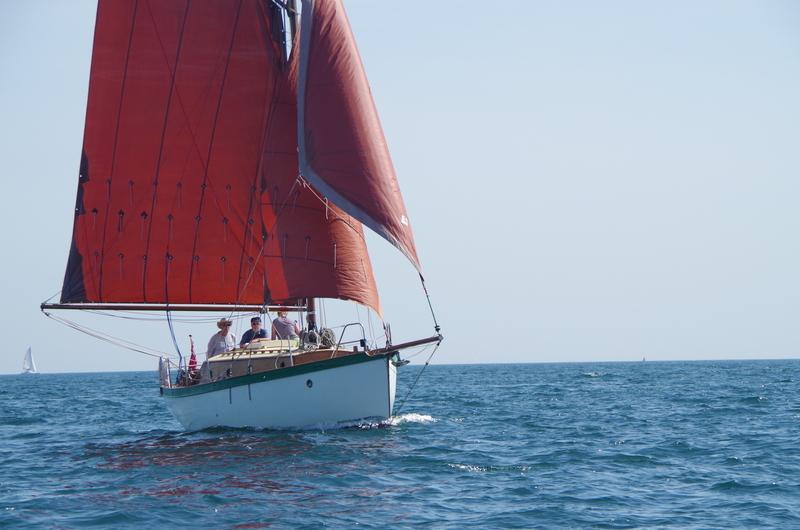 In fact it was a good day for the gaffers as we both then overtook a group of larger modern boats also under sail. We (gaffers) both had clean hulls and were both flying a goodly amount of sail for our weight, i wouldn’t have minded having an asymmetric spinnaker or big reacher but more on that later. Quite simply 2 very un sporty boats overtook 3 larger/longer modern boats, in easy downwind conditions that shouldn’t really happen……for now put that idea on the back burner while i lay out the main idea for today. Here is the main idea and then a series of back up explanations. 1. That all boats , when they come out of the factory or builders yard have a hard limit on their boatspeed and ultimately their windward/pointing ability and those 2 factors are determined by their length/waterline length according to the wave making/displacement rule but also affected immediately by their hull shape and keel configuration. A quick explanation here is that, lets say we took 2 identical hulls but gave one a deep and narrow chord keel and the other one a pair of shallow bilge keels then the deep keeled boat should always be quicker to windward because the keel will be more efficient. 2.That the same 2 boats then also have a lower ‘soft’ limit on their actual performance on the day that relates far more to their set up, their maintenance, how much load they are carrying and how well they are stowed etc and finally how well the driver is doing his or her job of sailing the boat. Thus if we took 2 absolutely identical boats but one has a scrubbed, wet sanded and carefully antifouled hull and the other is towing a garden then the first boat will be a lot faster than it’s identical twin. This is easy to see…..clean boats/smooth bums go faster ! We can also say the same thing for the way the rig is set up, the quality of the sails and halyards etc etc. Eventually we could take that all the way down to which boat has a metric-arse-ton of chain in the bow and which one is stowed more carefully. 3.This brings us onto the main point here and that is given that the boat has both hard and soft limits it is what we do with them that makes them either slightly worse than when they were built……or a lot worse ! Its actually quite rare for an owner to improve a boat’s performance although being a total smart-arse of course i have done it a couple of times and yes folks i will try and back up that claim. A simple example here is that if we take our everyday/unexciting boat , keep it’s hull clean and super smooth, attend to the rig tune, have decent sails and halyards, stow it well and then sail it well we will be getting nearly close (sometimes) to the boat’s ultimate potential. The opposite side is of course the story i told in the previous post. 4.That most boats, particularly the everyday cruising boats that i am looking at today can be improved way beyond the state we are likely to find them in when and if we take them on. Straight away most of you could outline the obvious moves : empty all the extraneous gear out (lighten the boat) clean and sand the bottom, blast the old antifoul off if necasary, fair the foils, set the rig up properly and maybe invest in a nice new headsail and new halyards…..etc etc. I know of well set up bilge keeled cruising boats that have thoroughly embarrassed fin keel cruiser-racers just by these simple routines. To back up my claim a little i would like to give a very quick overview of what i did with an ordinary ‘steady’ cruising boat that brought it back up to it’s potential and then went past its original performance envelope. This is of course my old Frances 26. Hull….rough with about 15 years worth of old antifouling, wet sanded over several sessions and many horribly dirty wet days until it was at ‘race’ standard and then carefully laid on 2 thin coats of antifoul. Each subsequent year scrubbed, lightly sanded and re-coated. Rig. Re rigged with new wire all round, raked aft slightly to achieve near perfect balance with the new sails. Bought new mainsail, replaced the small cutter headsails with a G2 and a smaller inner jib (staysail) for heavy weather (essentially became a ‘slutter’) Added a cruising chute and code 0 reacher. I shouldn’t need to say but i will say that the sails were hanked on for simplicity , got shockingly expensive new dyneema halyards and crucially tell-tales. Gear…..emptied all extraneous gear, re-stowed the essential gear such as anchors and chain off the bow and centred heavy moveable internal weight (water containers for example). My question today is “could we take another workaday ‘compromise’ boat and 1.bring it back to its maximum performance envelope and 2. Improve on that performance ” I happen to think that we can achieve both aims with an otherwise ordinary boat….the kind of compromise boat that is now on the list of boats to see. Give me wet and dry paper and a few days elbow grease ! Previous Just how bad ? Next Fish…or cut bait ? Maybe I will have to adjust my biased opinion of bilge keelers ! I agree that an average boat can be improved by some what would call basic maintenance and improvements that you have already outlined. Fair in that bob stay fitting 🙂 ?